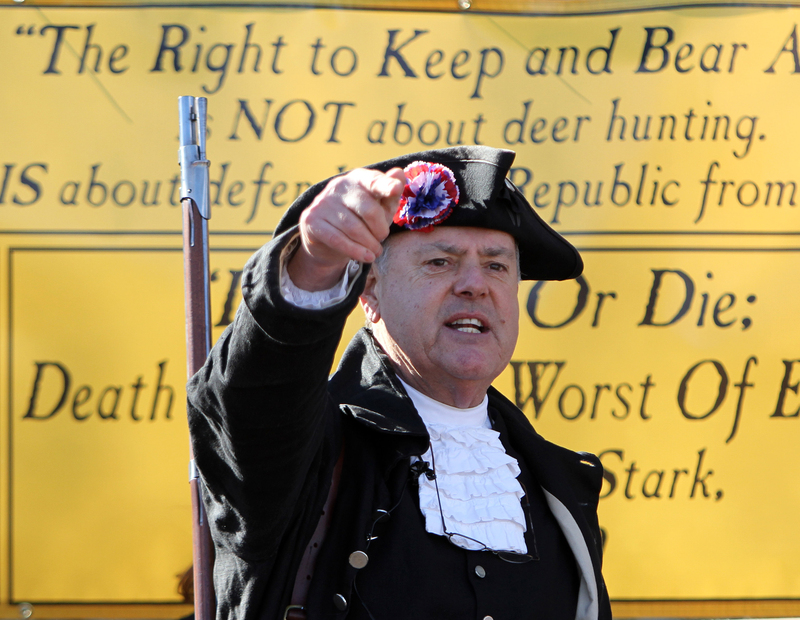 CONCORD, N.H. (AP) — Several hundred gun rights advocates — some toting rifles and holstered handguns — flocked to the Statehouse Thursday to oppose weapons bans and efforts to repeal parts of New Hampshire’s expanded stand-your-ground law. Speaker after speaker rallied the crowd of about 300 to hold firm to their firearms and their right to bear them. The rally comes a day after former Arizona Rep. Gabrielle Giffords, still recovering from a Tucson shooting spree that killed six people two years ago, implored federal lawmakers curb firearm violence, saying that “too many children are dying.” Also Wednesday, hundreds of residents of Newtown, CT. — where 26 children and staff were killed in a massacre in December — urged limits military-style rifles and high-capacity ammunition magazines. Speakers criticized Democrats in Washington for favoring new gun control laws following the Newtown shooting. Bob Guida, who campaigned unsuccessfully for Congress in the 2nd District, told the crowd, “We’re here to raise the alarm,” before leading the crowd in chant. Many in the crowd waved American flags or yellow ones bearing the slogan, “Don’t tread on me.” There was no sighting of supporters of gun restrictions or bans. About 200 people attended a House hearing last week on a bill that would repeal parts of a law that Republicans pushed through two years ago — over a governor’s veto and law enforcement’s objections — allowing people to use deadly force to defend themselves any place they have a right to be without having a duty to retreat. The deadly force law is based on the Castle Doctrine, which says a person does not have to retreat from intruders at home before using deadly force. The New Hampshire law — passed in 2011 — expanded that principle to public places. House Majority Leader Steve Shurtleff, D-Concord, is proposing again requiring people to retreat in public if it is safe to do so. The Thursday afternoon rally was organized by leaders of two conservative New Hampshire groups — the Rochester 912 Project and the Granite State Patriots. Those who signed a petition were given a raffle ticket to win 100 rounds of 9 mm ammunition.